Never Enough Nails: Happy Valentine's Day with Two LE Lynnderellas! Happy Valentine's Day everyone! What are your plans for the day? Dinner with that special someone or Netflix and ice cream with your special cat? LOL! Whatever your plans are, I have two really beautiful Valentine's Day limited edition Lynnderellas for you to see today. First up is Lynnderella Reddy for Love. 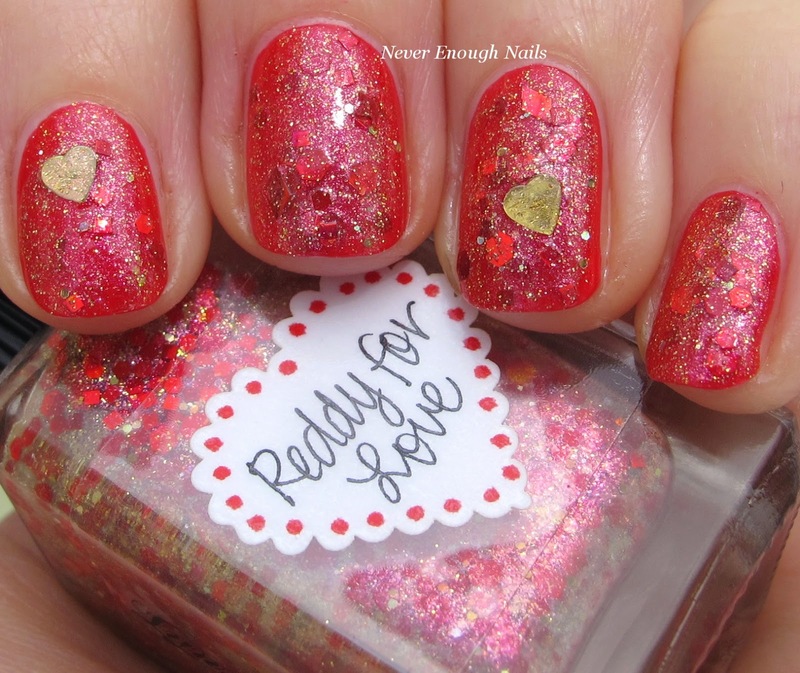 Reddy for Love is a mix of red and gold glitters in a heavily gold shimmered base. The gold shimmer in this is stunning! 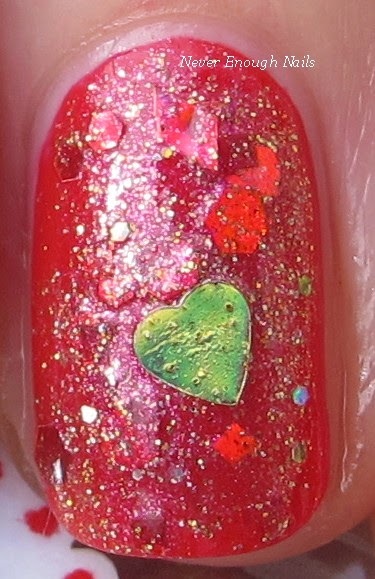 There are large holo gold hearts, red stars and diamonds and all kinds of other goodies. I wore this beauty over Essie Lollipop. This is just one coat of Reddy for Love over two coats of Lollipop. It was easy to apply, I only positioned the hearts a bit. I did not have to fish for the hearts at all, both of those just came out by themselves. I actually didn't want to take this mani off, it was so pretty! And I usually don't like to wear red! 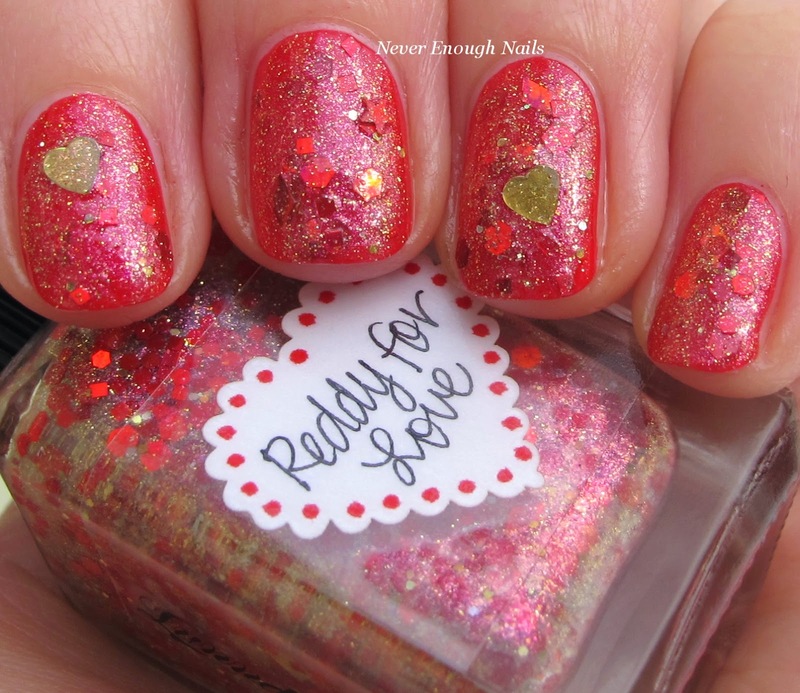 Lynnderella Le Sigh is kind of on the opposite spectrum of Valentine's Day polishes, it's a soft and delicate mix of glitter. 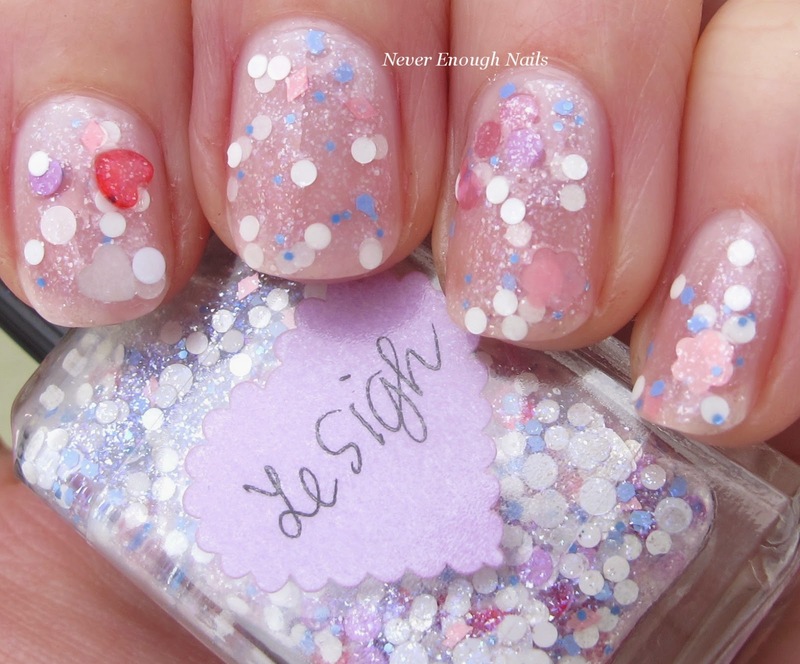 Le Sigh has white circle glitter, small almost periwinkle blue glitters, pink glitters (including large pink flowers, circles and diamonds), some lavender glitters and a few red glitters too. The base is clear with flecks of silver shimmer. You can see the flecks really well in the picture below. For this look, I did two coats of OPI Care to Danse?, two coats of Le Sigh, and one coat of Care to Danse? to top it off. Le Sigh was easy to apply. I did find I had to wipe off the brush maybe a little more than usual or SO much glitter came off onto my nails! But that's always better than not enough haha! Lynnderella Reddy to Love and Le Sigh are available on lynnderella.com and might pop up on lynnderella.storenvy.com. For news about the latest Lynnderella collections, visit lynnderella-lynnderella.blogspot.com. Also, have you seen Lynnderella's new adorable stickers (below)? 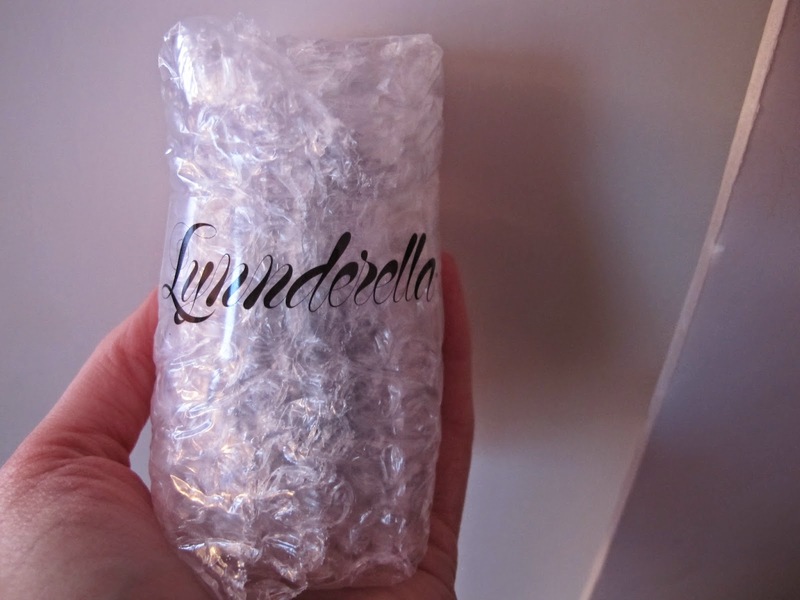 Instead of tape to hold the bubble wrap on to the polishes, Paul uses these cute stickers! I keep saving them, although I don't have anywhere good to put them. I think so too Ananka! So pretty!